Jenny McCarthy: Best. Meal. Ever! Tailgating is a time-honored American tradition. There are geographic variations, but the end result is the same. 3 Jenny McCarthy: Best. Meal. Ever! 4 Does Microwaving Vegetables Take Away the Nutritional Value? The essence of tailgating is simple: Get to the college or professional stadium a bit early, park in the lot and hang out. Have a meal or a snack, maybe a drink, socialize and get the competitive juices flowing for the game. But that’s not all there is to tailgating. To people who love it, it’s an event -- nearly as important as the final score of the athletic contest they came to watch. Sure, it can be an elaborate affair. Some well-heeled, well-schooled veterans make tailgating an art. They turn out in RVs towing monster grills behind them, set up satellite dishes to check out the early games being played around the country, open portable bars and prepare gourmet meals on the spot. But it doesn’t have to be that extravagant. Those who love tailgating say that with a little planning, a raid on your camping and backyard supplies and the right frame of mind, you can have a great day your first time out, without spending a lot of money, time or energy. If you want to call it tailgating and feel like you’re tailgating, there is a basic necessity of making it an event. The most important thing, according to those who know, isn’t the equipment, the menu or the liquid refreshment. It’s what coaches stress before the game: planning and preparation. “If you show up and you forgot something or forgot to make a list the night before, it’s going to make for a poor tailgate party experience,” said Dave Lamm, a 17-year tailgater who operates the website TailgatingIdeas.com. Forgetting things as basic as lighter fluid or ice can start the day off on a sour note. Plan to arrive three to four hours before kickoff, when the lot isn’t crowded. Look for shade, a location not too far from (or too close to) the restrooms and a slot at the end of a row so you’ll have more elbow room, advised Steve Glor, a 20-year tailgater who formerly worked for a tailgate equipment manufacturer. If several groups will be meeting, an early arrival will give you a shot at getting adjacent parking places. Also, the gates to some lots close an hour to 90 minutes before game time, Lamm said. 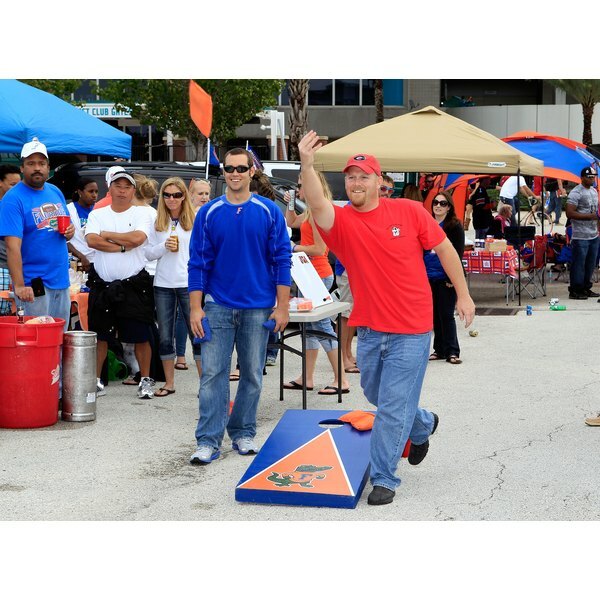 Well before you leave home, consult one of the websites that offer location-specific tailgating tips for stadiums around the country: where the restrooms are, which lots are best and where the rowdies gather, so you can avoid them or join in the fun. Lamm suggested TailgateWiki.com. The chairs and table you take camping will work fine, as will a camp stove, though a grill is easier to use. If you get into it, Lamm said, you might want to doll up some of your gear with logos from your team or buy items in team colors. Disposable plates, utensils, cups and serving dishes are practical and efficient, and they are becoming the only way to go in many stadiums that outlaw glass containers in their parking lots, fearing injuries and damage to tires. Glor noted that many companies make higher-quality, reusable plastic products if you want to go greener. Most people, Lamm said, go the disposable route. Bring a grill, of course, if you plan to cook, “but there’s no rule that you can’t buy a bag of sandwiches,” Lamm said. Pack sodas, beer and wine, but remember the glass issue. Glor noted that more and more craft beers are coming in cans. Mixed drinks can be a hit, but they’re more expensive and time-consuming to make, though you can mix a batch at home and take it in a plastic container. “And it always seems you can’t have too much bottled water and ice,” Lamm added. Just take home what you don’t use. • Use the tougher, freezer versions of zipper-seal plastic bags for the frozen foods you bring. Cahn freezes marinated steaks in bags and takes them out the night before the game. By the time he’s ready to cook them they’re thawed but still very cold – and safe. • If you don’t already do this at home, line your charcoal grill with heavy-duty foil for easy cleanup. • Pack frozen bottled water in the cooler. It will help keep things cold before you drink it. • Make burgers in advance, no more than ¾ inches thick, so they don’t take too long to cook. Freeze them between sheets of wax paper and put them on the grill still frozen for three to four minutes on each side. • Laminate your checklist and check off items as you pack with a dry erase marker. Wipe it off, and it’s ready for the next game. • Pack things in large plastic storage bins. • Serve food at least 90 minutes before the game starts. Since 1973, Michael Rudeen has worked for the “Alexandria (La.) Daily Town Talk,” “The Kansas City Star,” “Denver Monthly” magazine, “The Denver Post,” “The Denver Business Journal,” Colorado Public Radio and the “Rocky Mountain News.” The Tulane graduate in English is now a Denver-based freelance writer and editor.